Brilliantly colored sun conures are usually sold as juveniles in pet stores and from breeders. U.S. breeders attach leg bands that may include the bird's birth year. If no leg band is provided, you can approximate age of young conures by their coloration. You'll need to consult a vet to determine the age of older birds. 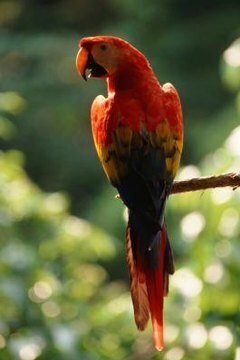 Conures begin life in a drab olive green color that helps babies in the wild camouflage themselves in the rain forest. You'll notice a few colored feathers begin to come in at about 6 months of age. After first molt, at 7 to 8 months old, your bird will begin to take on more colors. A bird between 1 and 2 years of age will have most of the bright yellows and oranges associated with conures, but the olive green wings will usually remain until full maturity at 2 years of age. BirdChannel.com: What Does the Info on the Leg Band Mean?